Justice League of Public Domain Victorian Characters? Yeah, it doesn’t exactly roll off the tongue. 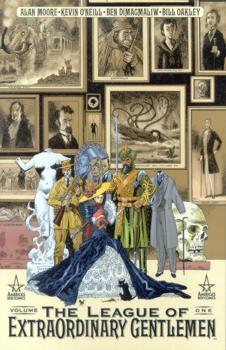 Alan Moore’s series, The League of Extraordinary Gentlemen , affords the readers a Steampunk setting for these fanciful creations of Victorian imagination. The original series, illustrated bye Kevin O’Neill, premiered in 1999 with Jim Lee’s Wildstorm Comics imprint and DC Comics formidable backing. Moore has noted as literary influences such diverse authors as William S. Burroughs, Douglas Adams, Aleister Crowley, and Oscar Wilde. The value of keeping literary characters available in the public domain is exhibited in not only Alan Moore’s authorship, but with the character’s portrayal across multiple forms of media delivery. It is unfortunate Moore has developed such an acrimonious relationship with Hollywood and we won’t have the chance to see his stories through a collaborative lens, as the movie industry takes his work from the page to the screen. At any rate, hope you enjoy a ride with some the iconic personalities of modern Western culture. Serial melodrama, based on the stories by Sax Rohmer. 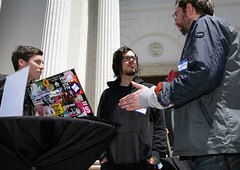 This entry was posted in Audio Archive, Books Archive, Video Archive. Bookmark the permalink. 1 Response to Justice League of Public Domain Victorian Characters?